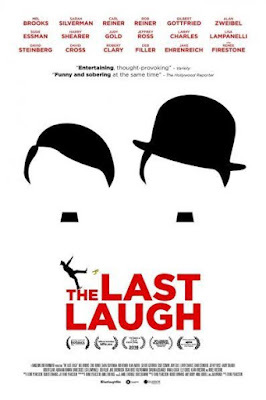 The Last Laugh is a feature documentary about humor and the Holocaust, examining whether it is ever acceptable to use humor in connection with a tragedy of that scale, and the implications for other seemingly off-limits topics in a society that prizes free speech. Premiered at the Tribeca Film Festival in 2016, the film had a theatrical release in NYC on March 3. It will be playing at Jewish film festivals and is in selected theaters now (see list below). The documentary is directed by Ferne Pearlstein, and produced by Robert Edwards, Amy Hobby, Anne Hubbell, Ferne Pearlstein, and Jan Warner. It includes commentary by Mel Brooks, Sarah Silverman, Rob Reiner, Gilbert Gottfried, Alan Zweibel, Harry Shearer, and David Steinberg. "The Last Laugh" is at its best when its people are telling jokes, often ones in which the Holocaust is involved. There's Baron Cohen in country-western mode singing "throw the Jew down the well," Sarah Silverman ending a skit with "Auschwitz? You'll say Wowschwitz" and Larry David focusing a "Curb Your Enthusiasm" episode on a dinner-party battle between a Holocaust survivor and a contestant on the TV show "Survivor." I think jokes about Camps,gas chambers ,Mengele are taboo. I do not tink anybody who was in one of those places, went through all those evil things will laugh at or tell this sort of humor. If part of "never forgetting" means that we do it through humor, then better that we should be able to laugh, as Chaplin showed in "The Great Dictator", Jack Benny in "To Be or Not To Be", and Mel Brooks in "The Producers." In this time of increased anti-Semitism, anything that can help build bridges and inform the general public is, in my opinion, a good thing. I can only hope that once people have seen this movie, they will move on to more serious ones, like "Schindler's List", "Night and Fog", and "Shoah." But baby steps hopefully will lead the way, and anything to keep the memory alive. My personal favorite "joke" against Hitler is a survivor, Yitta Schwartz, profiled in the New York Times who left behind 2,000 living descendants. Now *that* is a thumb in the eye of the Hitler and the Nazis.